The journey through grief is the loneliest of all and an understanding companion can be like a lifeline when all else seems in turmoil. Joan Wilson has suffered not one but three devastating bereavements. Her daughter Marie died as a result of the notorious IRA bomb at the Remembrance Day parade in Enniskillen in 1987. Her father, Gordon Wilsons gentle words that night gripped the worlds media and he later received numerous humanitarian awards. Yet it was Joans quiet faith which held the family together through this agonizing time. Some time afterwards, their only son Peter was killed in a car crash, and this was to prove a final straw for Gordon who, already unwell, died suddenly at home. Joan relates the story of each of these losses and has collected together some of the poems, prayers, Bible readings that helped her go on. Together with these are excerpts from the many hundreds of moving letters she received from around the world. Arranged in short sections, each dealing with a different phase of grief, this is a sympathetic book to lead all who are experiencing loss through the various stages of bereavement, step by gentle step. Full of kindness and wisdom, and offering friendship and support, it is a book to be dipped into time and time again. 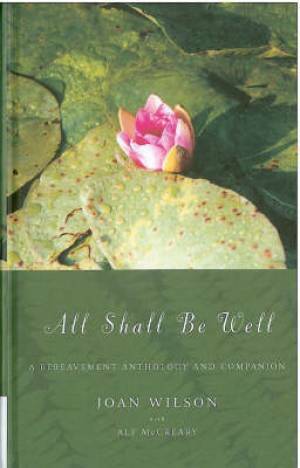 All Shall Be Well by Joan Wilson; Alf Mccreary was published by Canterbury Press in June 2008 and is our 17502nd best seller. The ISBN for All Shall Be Well is 9781853119323. Be the first to review All Shall Be Well! Got a question? No problem! Just click here to ask us about All Shall Be Well.